Twelve-year-old September lives in Omaha, and used to have an ordinary life, until her father went to war and her mother went to work. One day, September is met at her kitchen window by a Green Wind (taking the form of a gentleman in a green jacket), who invites her on an adventure, implying that her help is needed in Fairyland. The new Marquess is unpredictable and fickle, and also not much older than September. Only September can retrieve a talisman the Marquess wants from the enchanted woods, and if she doesn’t . . . then the Marquess will make life impossible for the inhabitants of Fairyland. September is already making new friends, including a book-loving Wyvern and a mysterious boy named Saturday. This is a book that I took my sweet time with -- not only in waiting around to read it after its initial publication, but during the reading of it, as well. Even though I knew that there are more books in the series, I didn't want September's adventure to end. Additionally, the world Valente has created is so rich in description that I wanted to let it all soak in a few chapters at a time rather than devouring it all at once. 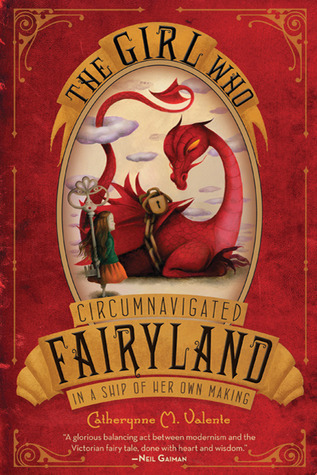 An epic, sprawling fairy tale, ...Fairyland... follows September as she finds herself whisked off to Fairyland, where she quickly makes friends and finds herself tasked with several quests, as all proper adventure stories must contain. The supporting characters are all fantastic, with layers and personalities and motivations that I'm sure will continue to be explored over the rest of the series. I was particularly interested in the Marquess and her motivations for the way she rules Fairyland, and the reveal there is, while a very tiny bit predictable, very touching and well-written. September is an excellent main character and I look forward to watching her grow up over the rest of the series. She's got the determination and heart of a young child, with a bit of beyond-her-years wisdom for good measure. While we don't get much of a picture of what September's life was like pre-Fairyland (her father is off at war and her mother works fixing airplanes), we do see that she is utterly devoted to her friends and to doing what's right, even if the right choice isn't always the easiest. She has several chances to take the easy, safe route, but never does, because she wants to honor the agreements she made and keep her friends safe. The writing can sometimes feel a bit too whimsical at first, and I had a bit of a difficult time getting into the story at first because it all felt very, well, sticky-sweet, which is not always my thing. But underneath the slightly twee nature of the writing is some solid worldbuilding and a lot of honest truths about the nature of love and friendship and responsibility that will resonate with readers of all ages. It's the kind of book that, if I had a child, I would want them to know this story and grow up with these sorts of wild fairy tales in their head. Some places call this a middle grade book, which is something that I question. Yes, our main character is a twelve-year old girl, but I don't know that the book, with its denseness and narrative asides and themes that may make the most sense to adults, would appeal to most younger readers. Perhaps as a read-along, with plenty of stoppages to learn new vocabulary words. (I mean, I'm fairly well-read and I think there were still a few words that I was like, 'wow, don't see that one too often'.) I'm sure there are middle grade/young adult readers who loved this and would prove me wrong, but I felt that most of the book's appeal was in simultaneously identifying with September, a little girl who wants to escape her hum-drum life, and identifying with the narrator, who tells the story with the wisdom of age that September lacks.